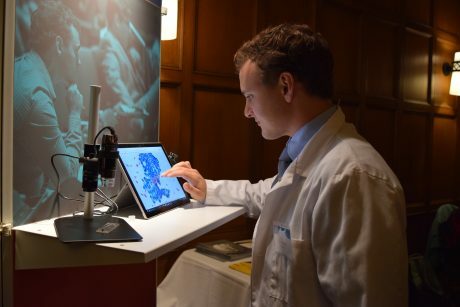 University of Michigan medical student Michael Moore has created a special technology that allows patients and healthcare providers to speed up diagnosis by ensuring that enough cells are collected during fine-needle aspiration biopsy procedures. Imagine going to the hospital for a biopsy to learn if you have a cancerous tumor. In the days leading up to the procedure, you’re filled with anxiety at the possibility that you might have something that could be serious, even terminal. Then what if you go through this entire process only to find out that the biopsy was inconclusive, and you have to do another… and maybe even another one? Unfortunately, this happens quite often—one out of five times, to be exact, innovator Michael Moore said. It occurs when not enough cells are collected during fine-needle aspiration biopsy procedures, and it’s a problem which, in turn, wastes time and increases patients’ stress when they have to return for another biopsy before learning a diagnosis. 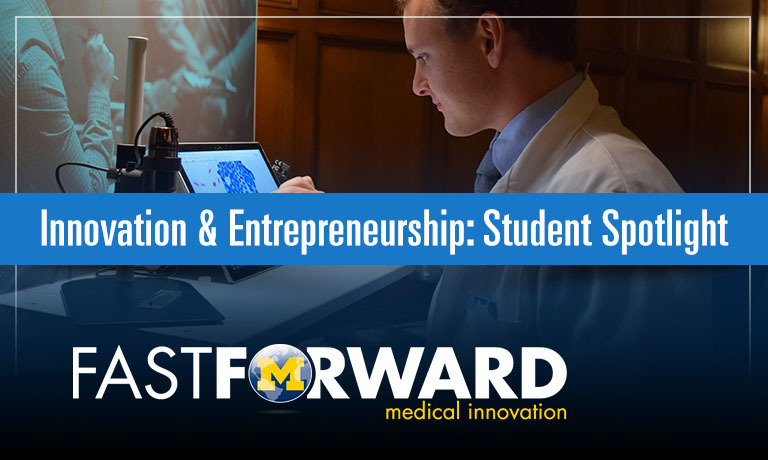 Moore, 24, a University of Michigan medical student and participant in Path of Excellence (PoE) Innovation and Entrepreneurship, made this discovery when doctors thought Moore’s father had tonsil cancer. The doctors did three biopsies that were all inconclusive before they ended up performing surgery, after all. “They don’t know what typically is in the needle when doing the biopsy and the patients have to come back and do another one,” Moore said. He aims to solve this with a special technology that allows patients and healthcare providers to speed up diagnosis by ensuring that enough cells are collected during fine-needle aspiration biopsy procedures. It does this by doing a cell count, so clinicians know almost immediately if they have enough tissue for a diagnosis. “When you get a biopsy the first time, you know what it is,” he said. The team behind the diagnostic, formerly called Soft Lesion Analytics and now branded Medkairos, is among the 12 Ann Arbor semifinalists in the Michigan Accelerate competition– one of the largest business competitions in North America, and the state’s largest gathering of high-tech companies and venture investors. The competition awards $1 million in prizes, including a $500,000 grand prize. On Thursday, Nov. 16, at the Detroit Masonic Temple, all semifinalists – including Moore and his team- will pitch their innovations for a shot at the grand prize. The top 10 finalists will pitch that evening during a gala awards dinner. The prize money would help transform Medkairos, closing its next round of funding, Moore said, and could change how the business is run. Before putting his ideas on a pathway to commercialization, the University of Alabama graduate discovered his passion for the field of medicine when his grandfather was going through the late stages of colon cancer. It was the time taking care of him and working as a wound care tech at an acute care center in Slidell, La., as an undergrad when Moore realized that medicine was a field he could picture himself in. It gave him the opportunity to interact with the patients and help completely transform their lives. This includes a patient who Moore said couldn’t feed herself after surgery. After taking care of her for a month, she was able to feed herself again. After completing his undergrad degree, Moore made the move up north to the University of Michigan where he enrolled in medical school. As a student, he had innovation ideas, but no business background, so he joined FFMI’s PoE program. It’s there where he got firsthand experience with the biomedical innovation process and had a chance to really see if his ideas were viable for commercialization. “I made a lot of mistakes and we pivoted a lot over the last year,” he said. In fact, he changed his product three times before realizing what the clinicians actually needed—a diagnostic that allows clinicians to get an accurate biopsy the first time. Now, Moore, alongside team members Andy Kozminski and Andrew Stephens, are working to get the technology developed even further and make it to the FDA. The ultimate goal, Moore said, is to make the leap to the National Institute Cancer centers, Commission on Cancer (CoC) hospitals, and other accredited cancer centers across the country. With this technology, Moore said he wants to work with the clinicians, not replace them.